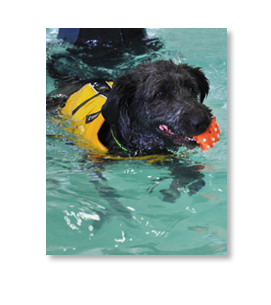 Hydrotherapy is a complimentary therapy that provides safe exercise without stress. It can have significant benefits in aiding your dogs healing and recovery rate after surgery or injury, increasing the chance of successful return to normal fitness. It is an excellent form of exercise because most of the muscles, joints and tendons normally used in movement are involved without weight bearing. The warm water increases the circulation to the muscles leading them to relax which reduces pain and stiffness and this then reduces swelling and enhances healing. The buoyancy of the water helps stiff painful joints and enables a greater range of movement.